What It’s About: Gengo Kotaka (Hiroshi Ishikawa) is a struggling would be comic book artist and author who thinks he’s scored his big break when he’s hired by the owners of Children’s Land, but he quickly discovers that they are not the benevolent organization dedicated to “bringing peace to all children” he thought they were as their methods are rather…permanent. Can Gengo and his friends find a way to stop the power behind Children’s Land? Can old duffer Angilias bring Godzilla to Children’s Land in time to stop Gigan and Ghidrah? Why Watch it Today? : We’re doing Godzilla movies the rest of the week in honor of Friday’s premier of the latest Godzilla movie. 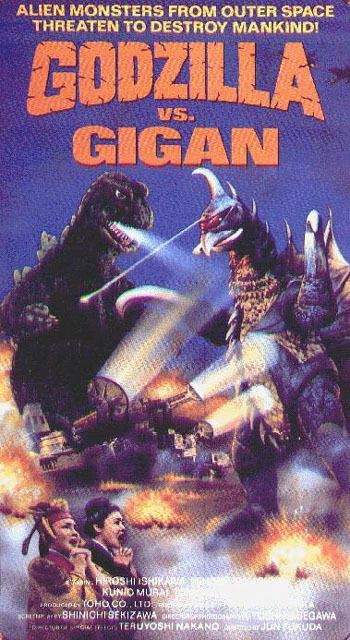 I first saw today’s film under its “Godzilla on Monster Island” title on The Creature Double Feature at the tender age of four or five, although I can’t say I recalled much of it until years later when I dug up a tape (now under its Godzilla vs. Gigan) title. To give you an idea of what re-titling did to you before the days of the internet and easy access to reliable reference sources, for years I’d assumed that the parts of this I did remember were from either Godzilla vs. Megalon or Godzilla vs. the Cosmic Monster or maybe even Destroy All Monsters (Angilias appears in quite a few of the Godzilla movies after 1968, and Destroy All Monsters is the only one that actually features an island called Monster Island). Thus I was pretty surprised when Godzilla vs. Gigan turned out to be a movie I’d seen before (especially since they put King Seesar’s priestess on the cover of the tape despite the fact she never appears in the film). In any case, this is not one of Godzilla’s more respectable outings, but it is a fun one, with a likable human cast, silly aliens with a ridiculous plan (and a gross secret), a fan favorite new monster with a buzz saw in his chest and hook hands, and some decent monster action if you don’t mind stock footage and things slipping into professional wrestling antics (or the fact that, depending on which version you see, the Godzilla and Angilias actually communicate via word balloons (Japanese) or goofy cartoon character voices (English dub). Maybe they’re just summoning King Seesar to help. This entry was posted in Aliens, Dinosaurs, Event Film, Kaiju, Movie of the Day, Sci-Fi, Sequel, Superheroes, War with Aliens and tagged Akira Ifukube, alien abduction, alien warning, aliens from a polluted world, aliens possessing the dead, Angillas, cockroaches, comic books, Drive-In, ecological warning, Ghidorah, Godzilla, hippies, Japan, Jun Fukuda, karate, Odious Comic Relief, prisoner, scientists, Shinichi Sekizawa, Showa Series, stock footage, stock music, superhero Godzilla, Takeshi Kimura, the declining years, theme park, Toho, Tomoyuki Tanaka, tower. Ay Carumba! 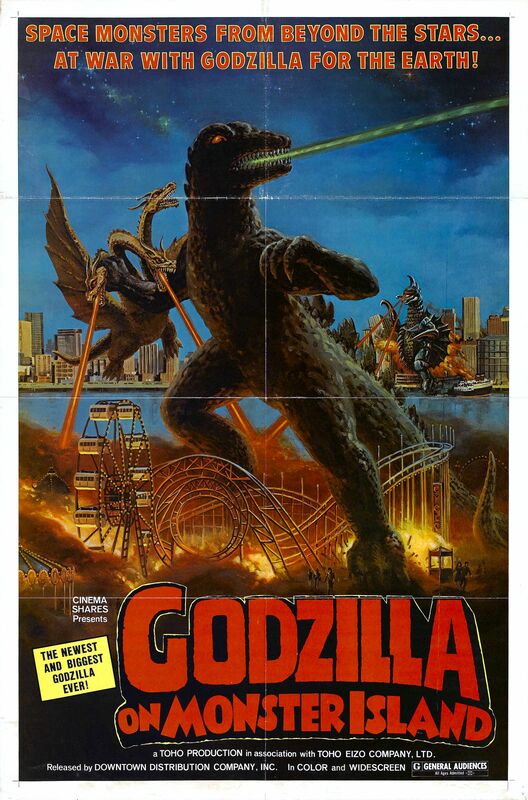 I think I didn’t like this as a kid because I’d seen a bunch of “serious” Godzilla flicks and they they started getting goofy.I was still a kid,but even I realized the quality was sliding into goofball territory. Still, I need to see the Japanese version now just for the word balloons!